For example, an absorbance of 3 means that the optical power is attenuated by the factor 103 = 1000. That would correspond to an attenuation by 30 decibels and a transmittance of 10−3. If several absorbing devices are used in series, their absorbance values can simply be added. 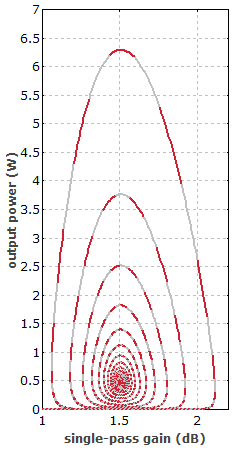 The absorbance of a homogeneously doped laser crystal, for example, is proportional to its length and the doping concentration. An alternative term, which however is ambiguous, is optical density. Absorbance values often depend on the optical wavelength. Note that optical attenuation e.g. of a neutral density filter may not be entirely resulting from absorption, but at least partially from reflection; the term absorbance is then questionable.